Dramatically Reduce Harmful Air Compressor Noise! Easy and Effective Portable Hearing Protection! 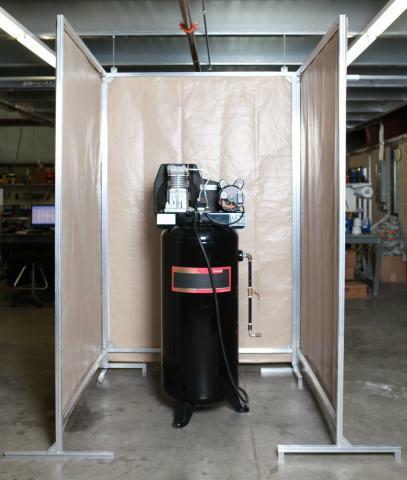 Portable Air Compressor Sound Control Screens feature a heavy duty -3/16″ Extruded Aluminum Frame. Note: There is a 4″ gap from the bottom of the curtain to the floor to allow air to flow through. There is a 7″ gap from the bottom of the curtain to the floor on screens with casters. Custom Made for Each Application! Goff’s Curtain Cleaner is a non-chemical based cleaner that cleans & removes dirt & grime from all types of vinyls. It is safe for all vinyl & pvc curtain wall product. It will not harm or yellow the clear window section and works great as an all purpose cleaner! Goff’s Shield All is an entirely water based liquid that creates a protective barrier for the curtain from dirt, grime, & over-spray. Goff’s Shield All dries transparent & “tack free”. The curtains remain flexible and flame retardant if peeled off. Easily wash off shield and dirt with water and re-apply for long lasting, clean curtains! 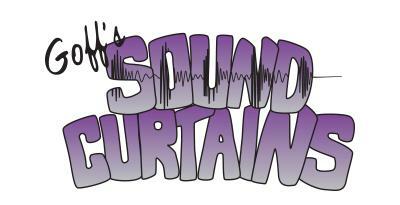 The SoundCurtain Floor Sweep is insulated and is replaceable if dirty or damaged. 9 Vinyl Color Options Available!